Alright, since our team is so chocabloc full of talent and plays accordingly ( ) let's talk about who each one of us thinks is the most talented team in the nba, regardless of win/loss record. Be honest, noone's opinion out does your own so say what you think about which team you think is the most TALENTED and why. They have the potential to be, but are not there yet. I think the Lakers have the most talent, with inside and outside threats of kobe and Gasol, with Bynum starting to realize his potential, Odom, and role players Fisher, Radmonavic, Vujacic, Walton, Farmar, and Ariza. You can give it to the Lakers, as well. But I find the Blazers as the deeper team. And since you asked Most Talented, I chose the Blazers. Their bench is 12-men deep and they have a ton young guns on that squad to contribute in replace of another player if someone is struggling. IMO, "Best Team" and "Most Talented" are two different things. Lakers are the "Best Team," Blazers are "Most Talented." xbay wrote: Talent wise? Trail Blazers. I think the most talented team is the Detroit Pistons... they draft really well except for Darko. They make the playoff finals consistantly.. maybe a little too consistantly. They have a really talented roster. I think the trailblazers will get there eventually. 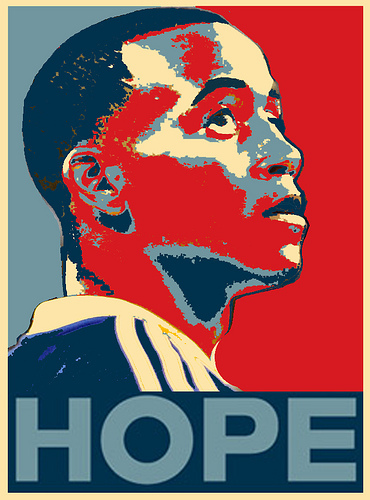 But right now its all potential apart from Brandon, LMA and Rudy. saintdee wrote: I think the most talented team is the Detroit Pistons... they draft really well except for Darko. They make the playoff finals consistantly.. maybe a little too consistantly. They have a really talented roster. Cmon Quazza and Xbay. Portland the most talented team? your logic is giving me a headache (see bigs avatar). TMC said it perfectly, POTENTIALLY they are the best team, but there no where near that yet. This one is simple, its the reining champions (which hurts me to say). KG and Pierce are still playing at or close to their best ball. Allen's game has stepped down a little, but is still a threat. And then their is Rajon Rondo, the most underrated player in the NBA, my BOLD Prediction Most Improve player of the year guy, and having him on 2 of my 3 fantasy leagues, i know the kid can ball. Also, there position role players are young (xept house), energetic, and have the passion to win (Allen, Powe, Perkins all quality role players). You mention Boozer. Right now I'm looking for a quick fix out of this morass. Do you think it's possible, particularly if the Jazz become plagued with more injuries, that they'd be willing to trade Boozer, maybe for Magette, Wright and Bellinelli? Or Maggs and Crawford for 2 expirers, Boozer and Harpring? With that first trade, it could look good. Mr. Crackerz wrote: Cmon Quazza and Xbay. Portland the most talented team? your logic is giving me a headache (see bigs avatar). you contradict yourself. you even highlight the word POTENTIALLY when talking about the BEST team. That's not what we're talking about here. We are talking about TALENT, not who's the best. For instance, i think AR is one of the most talented rookies in the league but he's no where near the best. I think there's a difference between most talented and most dominant. Boston is the most dominant. The Lakers are the most talented. I'd do that tade immediately, but the Jazz wouldn't do it, they know what non winners Maggette and Crawford are and they don't need them either. Offering the first trade you said, they might go for, as BWright is a young, versatile big that they might see having potential. Fine then, most TALENTED team is the Celtics, which...guess what, happen to be the BEST team.